Dale C. Allison Jr. is Princeton Theological Seminary’s Richard J. Dearborn Professor of New Testament. He obtained his MA and his PhD from Duke University. His academic research has focused on the historical Jesus, the Gospel of Matthew, the Sayings Gospel (Q), early Jewish and Christian eschatology, inner-biblical exegesis, the history of the interpretation and application of biblical texts, and the Jewish Pseudepigrapha. His book, Constructing Jesus, was selected as “Best Book Relating to the New Testament” for 2009–2010 by the Biblical Archaeology Society. 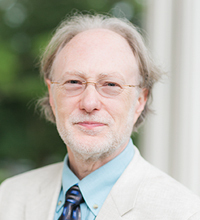 He served for several years as the main New Testament editor for de Gruyter’s international Encyclopedia of the Bible and Its Reception and has been on the editorial boards of New Testament Studies, Journal for the Study of the Historical Jesus, Journal for the Study of the New Testament, Horizons in Biblical Theology, Journal of Biblical Literature, and Review of Biblical Literature. On a more popular level, he has written books on the Sermon on the Mount, George Harrison, religious experience in the modern world, and death and what might lie beyond. He is currently working on a commentary of 4 Baruch and plans on writing one more big book on Jesus. He is an ordained elder in the PCUSA.